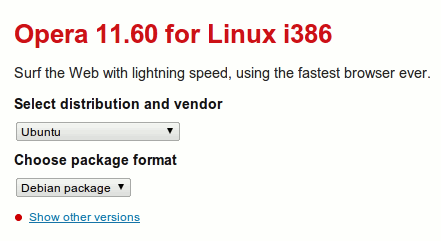 Ubuntu 11.10 (Oneiric Ocelot) users got Firefox installed by default – which is pretty good for browsing. If you’re not happy then there install Google Chrome or Chromium, you will be browsing seamlessly without any problem. 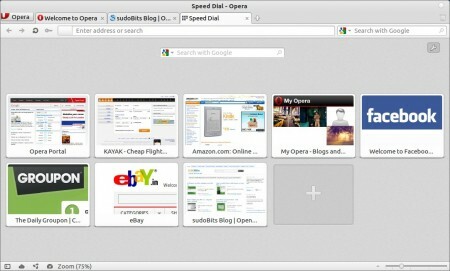 But in the case, if you want to try any other browser in Ubuntu 11.10, then probably you are looking for Opera. Opera has already been dominating the mobile browsing market, although it’s not so popular in desktop market (it’s probably the 4th most popular browser in desktop market) but it’s a pretty good browser; well, it also support modern good stuffs (HTML5, CSS3, etc) you don’t want to miss. Opera have a lot of cool features including tabbed browsing, mouse gesture, page zooming and a well integrated download manager (super cool!). Opera is also known as the origin of a lot of cool features that every browsers adapted later. Opera is available for a lot of platforms – GNU/Linux, FreeBSD, Microsoft Windows and Mac OS X. The latest version of opera – 11.60 released in the first week of the Dec 2011. For Debian based linux distributions, such as Ubuntu, Linux Mint – download the *.deb package and install it either with Ubuntu Software Center or gdebi Package Installer. #2. Then open the download file (something like this : opera_11.60_i386.deb) with Ubuntu Software Center (If you’re using Linux Mint then open it with gdebi package installer), click on install to continue and wait for the installation to complete. 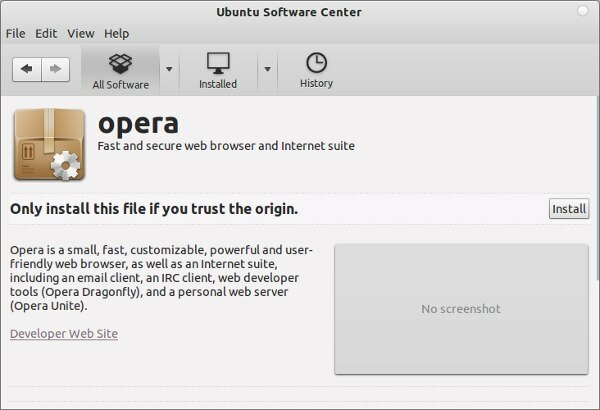 step1 : Open any browser and go to opera’s official website for downloading the latest version for ubuntu 10.04.
step2 : Select the operating system(Here it is Ubuntu although it may not be necessary if website will automatically detect) and in package format leave it as default package for easy installation. 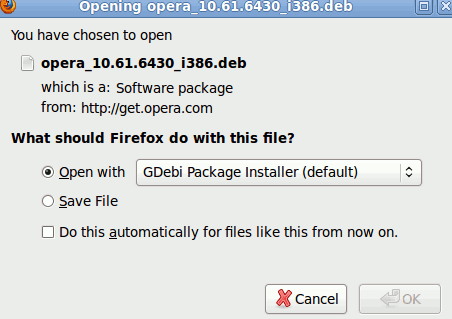 step3 : Now click on Download Opera.Then downloading will start and an option will come for opening the package with GDebi Package Installer so click ok.Next downloading will be complete within few moments and installation will start.Finally click on install package to begin the installation and installation will be complete within few seconds. step4 : End of the Fun.I assume you have installed opera 10.10 on Your Ubuntu successfully!